Granular control over user actions. Take better control of your community! 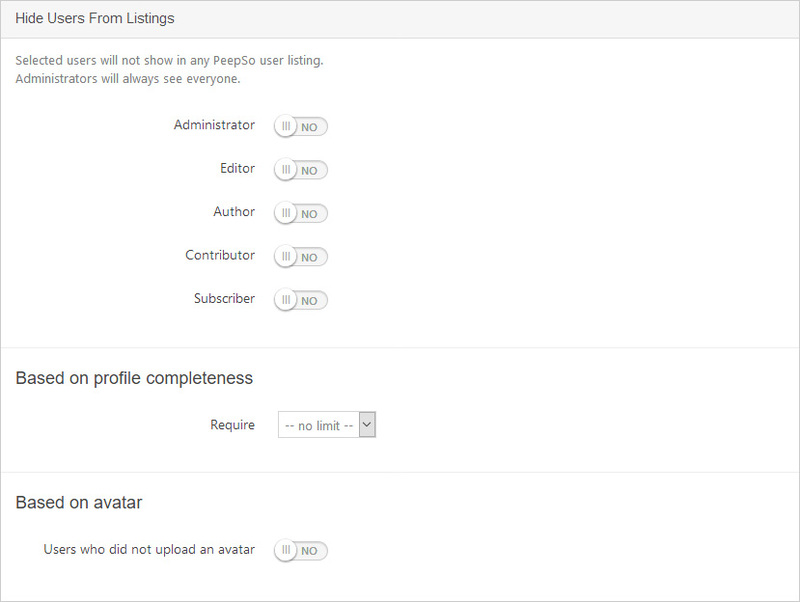 This plugin lets you restrict user access to selected abilities based on their role and/or required percentage of complete profile fields, and/or required custom avatar upload. Hide Administrators (or any other roles) from Members page. When Photos Plugin is installed you can disable photo uploads until user fills enough profile fields (% defined by you). When Videos Plugin is installed you can disable video sharing until user fills enough profile fields (% defined by you). When Groups Plugin is installed you can group creation until user fills enough profile fields (% defined by you). When Chat Plugin is installed you can disable new conversation creation until user fills enough profile fields (% defined by you). When Friends Plugin is installed you can disable sending Friend requests until user fills enough profile fields (% defined by you). Don’t allow posting Status Updates by users without an avatar and / or until user fills enough profile fields (% defined by you). Don’t allow posting Comments by users without an avatar and / or until user fills enough profile fields (% defined by you). Don’t allow posting Polls by users without an avatar and / or until user fills enough profile fields (% defined by you).